One of the most dreaded jobs in the business of rehabbing houses is wallpaper removal. 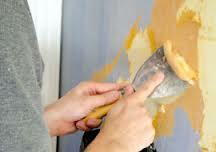 It's tedious work and it almost always leaves the walls damaged so they need costly repairs. Wallpaper was big in the 70's and 80's and is making a comeback. The good news is that with new products on the market, you now have options for removing old, ugly wallpaper that make the job a whole lot easier. I recently came across a product that seems like the answer to everyone's prayers when it comes to wallpaper removal called “SimpleStrip”. It makes the job not only bearable, but what may even seem “not so bad” in many cases. Does it sound too good to be true? You can read more about SimpleStrip here and watch a short video so you can judge for yourself. Thank you for this great information about Simple Strip! You are a lucky guy Terry considering the business you are in. Fortuntely, I haven’t had the pleasure of removing any wallpaper from an investment property yet. But, thanks to your article, now I’ll be prepared!